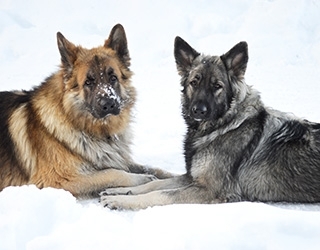 “Registered, health tested Shiloh Shepherds. Our focus is on producing healthy dogs of sound temperament bred true to type. We strive for friendly, loving companions who are at home in any environment. Our dogs live in our home with us and are part of everyday life on our ranch. They get along well with horses, cattle, sheep, chickens, cats and anything else we choose to add to the mix. They are loving and gentle family members who love nothing better than to hang out with our young grandchildren.